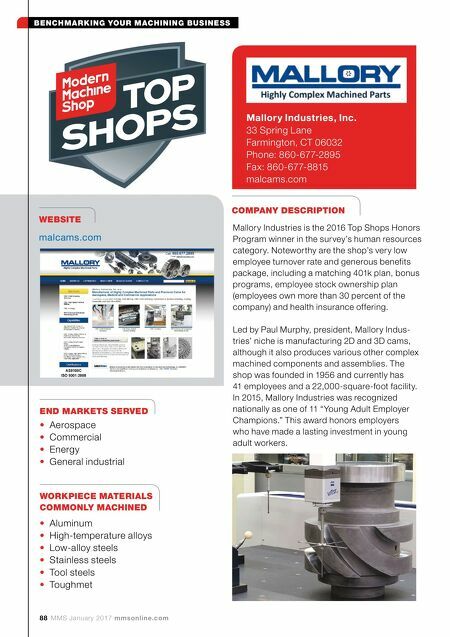 BENCHMARKING YOUR MACHINING BUSINESS mmsonline.com MMS January 2017 89 Mallory Industries has a range of machining capabilities. Resources include 34 cam milling machines, five turning centers, two six-axis turn-mills, seven three- and four-axis VMCs and one HMC as well as EDM, grinding and honing equipment. The shop also has two CMMs, a laser marking machine, a tool presetter and manual machines. Still, its focus on workforce develop- ment has also been a key to its success. This is exemplified by its winning the "Young Adult Employer Champions" award through its promotion of effective hiring techniques and access to onsite training and skills-development opportunities. Mallory Industries is committed to a culture that is rooted in lean manufacturing initiatives. Employees are constantly trained in setup reduction, mistake proofing, standardized work and root-cause analysis. Other lean concepts include 6S workplace organiza- tion, visual boards, kitting for all machining jobs, total preventive maintenance, and daily Gemba meetings and shopfloor walks. 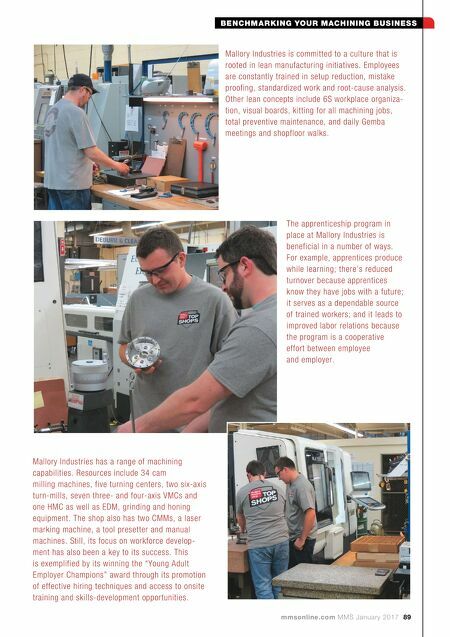 The apprenticeship program in place at Mallory Industries is beneficial in a number of ways. For example, apprentices produce while learning; there's reduced turnover because apprentices know they have jobs with a future; it serves as a dependable source of trained workers; and it leads to improved labor relations because the program is a cooperative effort between employee and employer.